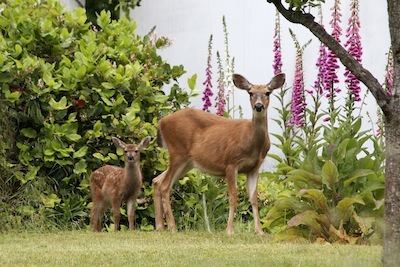 Deer are the number one wildlife problem that gardeners face, according to the letters GardenSmart receives. Our sponsor, Havahart®, has innovative answers. Even if deer are not troubling your garden, these Spray Away deterrents will work for many, if not all, of the creatures bothering your garden. It detects the heat and movement of an animal and when triggered the sprinkler mechanism deploys. I recently talked with a friend who lives on a lake. Canada geese are beautiful, majestic birds that love to follow walkways into a lawn or garden. Unfortunately, after their visit, it is next to impossible for the homeowners to walk in the yard without stepping in geese manure. Havahart®’s Spray Away has solved the problem. The surprise water spray has trained them to stay down near the lake. Havahart Spray Away® Motion Activated Sprinkler 2.0 runs on 4 AA batteries. It uses an infrared sensor to detect heat and movement when an animal comes within 35 feet. It is adjustable up or down so that you can select the size of your target animals. It uses quick bursts of water and movement to scare intruders like deer, cats, dogs, skunks, rabbits, groundhogs, raccoons, geese, and others from areas it is protecting. The original Spray Away 2.0 has worked very well for folks that have a garden hose that reaches into the area they want to protect. Now there is a new Spray Away, Havahart® Spray Away Elite II Motion Detector Sprinkler, which has a solar charged battery and has its own water reservoir. Now you can place these safe and effective deterrents anywhere in your yard or even in an area far away from a water source. A full reservoir is good for 30 activations. Since it only uses a small amount of water each time, it does not need frequent filling. Warning lights will let you know when it needs tending. Since the Spray Away Elite II is fully portable, you can locate it anywhere in your yard or garden. 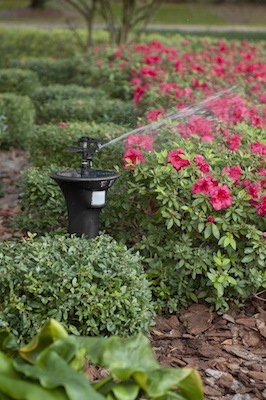 An adjustable sensitivity setting and random spray pattern prevents animals from growing accustomed to the sprinkler. Still, it’s a good idea to move it around occasionally so that animals don’t decide it’s safe to pass it by. Surprise coupled with unfriendly movement and contact help to send unwanted animals safely away.